We love to be waist deep in the swamp! Traditional wetland remediation and restoration projects entail temporary roads, drainage structures, or levee systems. Recovery from this approach takes longer as the wetland is destroyed while it is getting cleaned up. 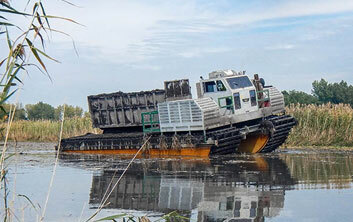 At Brennan, we have customized amphibious equipment that can avoid the need for costly temporary roads and shallow-draft dredges so the marsh doesn’t have to be drained. Our amphibious equipment is designed to match the production rates of alternative methods. Larger than what can be found on the rental market, Brennan’s amphibious equipment can be used to excavate, transport, and transfer contaminated sediment from a variety of wetland conditions. When the water is too deep and the ground is too unstable to use traditional equipment, or the water is too shallow and vegetation is too thick to use shallow-draft barges, our amphibious equipment is the perfect solution. In all cases, this equipment has extremely low ground pressure, and can float fully loaded when required to cross channels or lakes. Brennan also has the ability to hydraulically or mechanically dredge in areas where floating is possible. Our portable, shallow draft dredges are able to dig through heavy vegetation while maintaining production rates. Coupled with a debris management program, this is a very cost effective option. Once the excavation is complete, Brennan can rebuild and restore the wetland using clean materials. Using much of the same equipment, we can install clean sand, engineered caps, organic black dirt, and native vegetation. Restoring wetlands may include materials from nearby borrow sites or from distant locations. Our Environmental Group can help develop a plan that will meet a variety of requirements and budgets. J.F. Brennan Company specializes in water-based remediation and habitat restoration projects throughout the United States. We have successfully completed some of the most challenging environmental dredging and restoration projects to date. 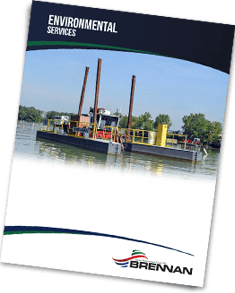 Download our brochure here to learn more about our wetland remediation capabilities and other services that we offer. Want more information on our Wetland Remediation capabilities? Fill our the form below!